Also serving communities of Hilmar. There are 9 Assisted Living Facilities in the Turlock area, with 7 in Turlock and 2 nearby. The average cost of assisted living in Turlock is $2,700 per month. This is lower than the national median of $3,346. To help you with your search, browse the 49 reviews below for assisted living facilities in Turlock. On average, consumers rate assisted living in Turlock 4.3 out of 5 stars. Better rated regions include Hughson with an average rating of 4.8 out of 5 stars. Caring.com has helped thousands of families find high-quality senior care. To speak with one of our Family Advisors about assisted living options and costs in Turlock, call (855) 863-8283. Turlock is located at the eastern edge of the booming Silicon Valley in California. Home of California State University Stanislaus, Turlock prides itself on creating a unique college town vibe in a laid-back, rural community. Turlock has experienced rapid population growth over the last few decades, with a population now of over 73,000, 13.4 percent of whom are seniors over 65. With 21 assisted living facilities in the area, those seniors have plenty of options for retirement living. 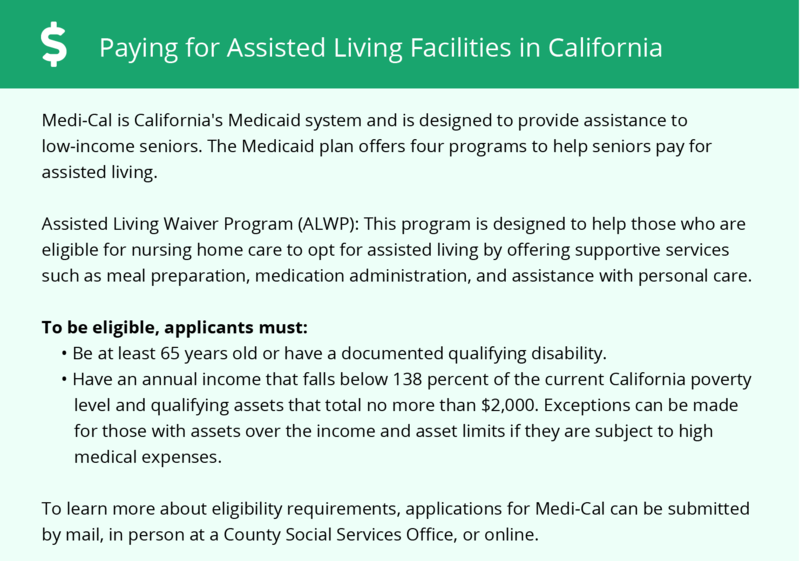 California licenses assisted living facilities through the Department of Social Services. Their Senior Care Licensing Program monitors residential care facilities for the elderly and Continuing Care Retirement Communities. Turlock's weather is characterized by long, hot summers and mild winters with little rainfall. July high temperatures can reach 94 degrees, while January lows average around 38. Seniors with health conditions alleviated by warm weather may be comfortable here. On a scale of 1 to 100, with 1 being the safest, violent crime rates in Turlock are 49.5, which is significantly higher than the U.S. average of 31.1. Property crime rates are higher than the national average as well. Seniors are advised to use caution and travel in groups if out at night. Cost of living in Turlock is 120, compared against a national average of 100. While health care, utilities and grocery costs are on par with or slightly lower than the rest of the country, housing costs are more than one and a half times the average, which may affect assisted living rates. Turlock Transit provides fixed bus routes and dial-a-ride program to the community of Turlock. Seniors over 65, Medicaid cardholders, those with a qualifying disability and veterans are eligible for reduced fares. Paratransit is also available. Turlock has an array of community resources for seniors, including Turlock Senior Citizens, an organization that offers a calendar of special events, fitness classes, group activities and a goal of providing opportunities for seniors to pursue their interests in all the community's activities. The Turlock area is home to world-class medical facilities, including Emmanuel Medical Center, in the event of medical emergencies or illness. Assisted Living costs in Turlock start around $2,700 per month on average, while the nationwide average cost of assisted living is $4,000 per month, according to the latest figures from Genworth’s Cost of Care Survey. It’s important to note that assisted living rates in Turlock and the surrounding suburbs can vary widely based on factors such as location, the level of care needed, apartment size and the types of amenities offered at each community. 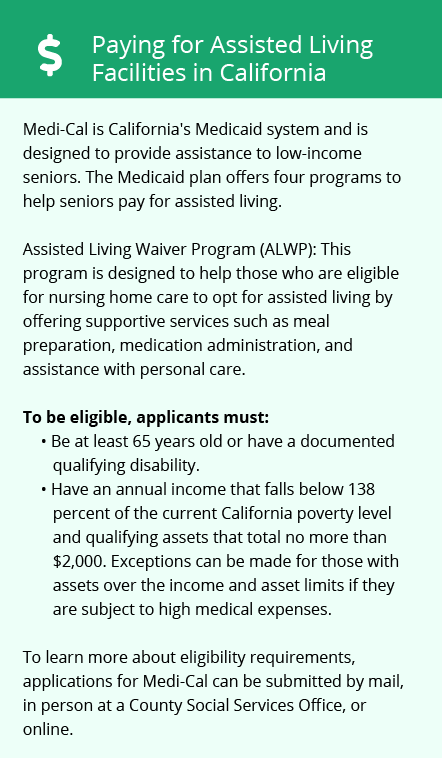 Senior citizens in Turlock, as in all of California, including those under 62 with a qualifying disability, may be eligible for the Assisted Living Waiver (ALW), which is a Home and Community Based Services (HCBS) waiver created by legislation that directed the California Department of Health Care Services (DHCS). Turlock and the surrounding area are home to numerous government agencies and non-profit organizations offering help for seniors searching for or currently residing in an assisted living community. These organizations can also provide assistance in a number of other eldercare services such as geriatric care management, elder law advice, estate planning, finding home care and health and wellness programs. To see a list of free assisted living resources in Turlock, please visit our Assisted Living in California page. Turlock-area assisted living communities must adhere to the comprehensive set of state laws and regulations that all assisted living communities in California are required to follow. Visit our Assisted Living in California page for more information about these laws.